M.I.L.E.S is an active program for mature adults ages 55+. Our instructors are from MCC and the surrounding community. Class subjects include personal enrichment, academic arts, and cultural enrichment. Come meet new friends with common interests and enjoy the beautiful campus at MCC! Keynote session is free and open to the public. 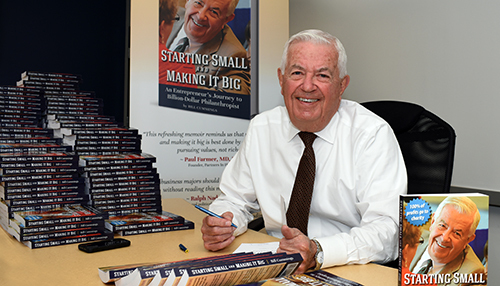 Bill Cummings became a serial entrepreneur in earnest, and then a philanthropist, after first working all over the country with two national consumer-products firms. In 1964, he spent $4,000 to purchase his first real business, a hundred-year-old manufacturer of fruit-juice-beverage bases, which he quickly expanded by providing refrigerated dispensers and drinks to several hundred colleges and universities. With the million-dollar proceeds from the sale of that business in 1970, he founded a suburban-Boston commercial real estate firm. Cummings Properties quickly grew from one small building to a portfolio of more than 100 modern buildings today. Along the way, he accumulated uncommon wealth, much of which he and his wife, Joyce, have been actively disbursing through Cummings Foundation, which they established together in 1986. Bill and Joyce were the first Massachusetts couple to join the Giving Pledge, an international philanthropic organization founded by Bill and Melinda Gates and Warren Buffet. Opening Session is free and open to the public. Refreshments served. *Please note: All classes are 2p- 4p unless otherwise stated in the semester brochure schedule. All MILES members are able to access/park in any student parking lot. Parking passes are not required. Please do not park in visitor or staff lots. Most classes are held in Henderson Hall located right next to Student Parking Lot A. MILES classes are not eligible for tuition waivers. Please provide a valid phone number and e-mail address when registering. To enroll call 1-800-818-3434.